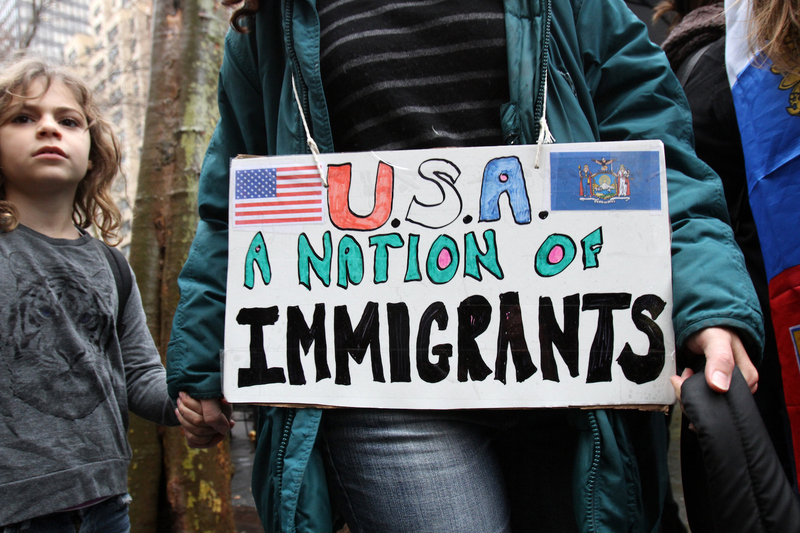 A woman holds a child's hand as they arrive for a rally in support of immigrants' rights Dec. 18 in New York City. (CNS photo/Gregory A. Shemitz). One of the most jarring revelations of the 2016 presidential election was that identity politics—normally associated with the American left—had jumped boundaries and been claimed by the white working and middle class as an ethno-nationalist movement. “Make America Great Again,” meant many things to many people, but it undoubtedly included the reassertion of a particular racial and cultural identity within politics. This surprising turn of events has led some critics to turn on identity politics itself. One is Mark Lilla, a professor of intellectual history at Columbia University, who recently claimed in The New York Times that “the age of identity liberalism must be brought to an end” because it has “produced a generation of liberals and progressives narcissistically unaware of conditions outside their self-defined groups.” Needless to say, Mr. Lilla advocates abandoning identity politics as a failed project. But this is a grave mistake. The rise of right-wing identity politics means Americans need to redouble their efforts to understand selfhood and diversity in the modern age. Perhaps no living philosopher has done more to shed light on these questions than the Catholic Canadian Charles Taylor. Mr. Taylor’s reputation within contemporary philosophy is formidable. One of the most important contributors to the debates over multiculturalism in the 1990s, he became perhaps the leading thinker in the 2000s on what it means to live in a secular age. In shortest form, what Americans can learn from Mr. Taylor is the following: The key feature of modern times is pluralism. This means the longstanding view that a secular age is one of increasing unbelief and homogenization of culture around a single set of values is wrong. Instead of homogenization, secularity means an explosion of spiritual and religious options—some traditional, others completely new. The fact that modernity is primarily characterized by exploding diversity puts the problem of identity squarely at the center of societies like the United States. This means that when Mr. Lilla demands that identity politics “must be brought to an end” he is asking for something that runs against the basic sociological conditions of modernity. Modern people are hyperaware of the diversity of identities and this makes us fragile and insecure. Each of us knows that there are other individuals of intelligence and goodwill who pursue radically different spiritual, political and cultural conceptions of what is good. This is in sharp contrast to premodern times. For example, in the medieval age, a peasant from Avignon was completely immersed in the horizon of his traditional world. It would have been difficult if not impossible for him to imagine his identity being radically called into jeopardy. It might even have appeared to him to be secured from time immemorial. But we moderns suffer from a very specific anxiety: We sense the radical contingency of our identities as cultural, religious, ethical and spiritual options. We sense that our identities are fragile and expressed not from time immemorial but within a bounded period of historical time. For this reason, we recognize that our identities can either succeed or fail to achieve political legitimacy and social acceptance. There is even the possibility that our identities will be eradicated. The politics of recognition—although it is an almost inescapable feature of modern pluralism—also has a dark side according to Taylor. Insecurity can drive a group to attempt to eliminate diversity as a way out of its sense of fragility amid pluralism. Can the force and authority of the state be used to restore the stability and dominance of a traditional identity? This seems to be the hope to which Breitbart and the more aggressive features of Trumpism appeal. Or, alternatively, perhaps the power of the state can be used as a sanction against traditional moral views in support of newer identity claims. Here parts of the liberal left have arguably overstepped their bounds. Identity politics is in this way at the very center of the age of Trump. A whole host of writers have been warning us that the culture, faith and habits of white working-class Americans have been demeaned by the urban, liberal elite. J. D. Vance has written a much-discussed memoir, Hillbilly Elegy, about the way this scorn is felt by working-class rural families. “We’re more socially isolated than ever,” Mr. Vance reports, “and we pass that isolation down to our children.” Likewise, many of the Christian conservatives who voted for Donald J. Trump have expressed a deep anxiety about a loss of religious liberty at the hands of those who no longer respect their views. The backlash against this perceived sneering at white working-class and traditional identities has been undeniably severe. As part of this backlash, other identities have come under attack: Muslims, Hispanics, women, blacks, etc. These groups are increasingly targets of exclusionary rhetoric and reactionary hatred as disaffected white Americans attempt to restore a sense of lost greatness. Hate crimes are up. There is talk among some of Mr. Trump’s high-profile supporters of authoritarian measures like keeping a database of “dangerous” religious minorities. The attempt to secure one’s sense of identity is linked to some of the most extreme forms of mass violence in the modern world. So, if identity politics across the political spectrum are an inescapable feature of the fragility introduced by modern pluralism, how does Charles Taylor believe modern people should respond? Should, as Mark Lilla suggests, modern people try to lessen the significance of their identities when it comes to politics? Mr. Taylor suggests a different approach. Basically, debates in society need to be about what constitutes a reasonable amount of pluralism. From this perspective, the big trap American politics has fallen into in recent decades is attempting to canonize particular ethical or moral views through the state (for example, the heated battle over traditional versus gay marriage, or the similar one going on over bathrooms). American politics has been playing a dangerous game, where identities on all sides feel existentially menaced by each new election. Under this analysis, Trumpism is simply the most extreme expression of this anxiety to date. Instead of terrorizing each other with control of the state every four years, Americans might spend more time finding ways to accommodate a diversity of identities across the political spectrum. The federal government would have a role to play in securing certain rights, but local governments would also allow for different communities to live out their diverse ethics. Rather than trying to create a national moral monoculture through the courts (which misunderstands the meaning of our secular age) Mr. Taylor’s brand of multiculturalism seeks to protect a diversity of religious and spiritual options. All this implies a rather surprising way of looking at how democracies work well in the modern age. Contrary to the view that agreement around human rights is achieved by homogenizing toward a single dominant ethic (“Judeo-Christianity” for conservatives, or “secular progressivism” for liberals, or some version of Enlightenment liberalism for Mr. Lilla), consensus is achieved by allowing for creative re-immersion in particular traditions. We urgently need to reassess what we understand by being “modern” people. Among other things, across the political spectrum we need to become far more comfortable with the cultural and philosophical role of traditions and pluralism. To be an advocate of modern, secular societies, then, means to embrace a pluralism that includes both the traditional identities of the white working class and Muslims, of evangelicals and the L.G.B.T. coalition. In a recent feature in The New Yorker, Mr. Taylor was quoted as saying that dialogue with opponents in the age of Trump is deeply in need of three simple, humble steps: First, “try to listen”; second, “find out what’s troubling” your opponent; and third, “stop condemning.” In this, Mr. Taylor’s Catholic-informed ethic is very close to that of the current pope, who has repeatedly advised Christians that they need to develop “in a special way, the capacity to dialogue and encounter.” In other words, contra Mr. Lilla, American society is going to have to become much more comfortable with the deep diversity of identity politics across the entire spectrum of society if it is to fare any better in the coming year than it did in 2016. With respect, I would like to add a comment to the idea the author developed that can be summarized by the three excerpts from the article which are quoted below. "Each of us knows that there are other individuals of intelligence and goodwill who pursue radically different spiritual, political and cultural conceptions of what is good." "...We recognize that our identities can either succeed or fail to achieve political legitimacy and social acceptance. There is even the possibility that our identities will be eradicated." "From this perspective, the big trap American politics has fallen into in recent decades is attempting to canonize particular ethical or moral views through the state...." First, I'm not sure that we are aware that we know about the other "individuals of intelligence and good will. " Secondly, recognition of "the possibility that our identities will be eradicated" is a cause of serious fear. Thirdly, as we know, fear is the emotion most easily and therefor most often exploited by demagogues, and consequently the most frequently incited by them. Fourthly, the gravity of the resultant situation is seriously understated by describing it as a trap that American politics has fallen into. Politics is a tool used in the process of obtaining power. Politics cannot be trapped. Only people can be trapped. The problem situation is not an abstract one. It is real. This fear that leads to a forceful urge to apply the power of the state against those who are feared to be destroyers of one' s identity is the thing that has to be eased, calmed, assured, and consoled somehow. Jason Blakely is an assistant professor of political science at Pepperdine University. He writes on politics, philosophy, and human behavior. His book Alasdair MacIntyre, Charles Taylor, and the Demise of Naturalism: Reunifying Political Theory and Social Science was published in 2016.